Home»All»Now Closed: Polovina Italian Cafe – Our Search for Houston’s Best Restaurants for Kids! 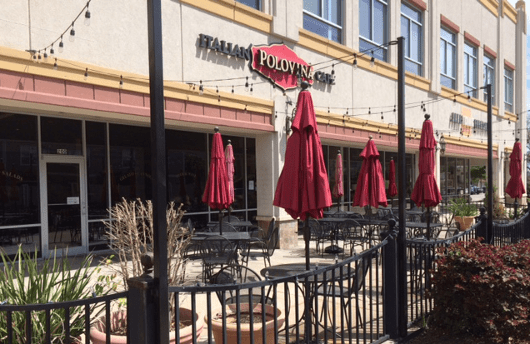 Now Closed: Polovina Italian Cafe – Our Search for Houston’s Best Restaurants for Kids! Our weekend was really busy with baseball opening day, family visiting from out of town and a birthday party so finding time to eat out was a fun challenge! We left our son at his birthday party and my husband and I realized we had time for a surprise lunch date! I am sure you know how rare and special these special surprise moments are, so do we! So where did we go? Polovina Italian Cafe. It is on Washington Ave which has a lot of fun restaurants as well as bars. The patio with the colorful umbrellas drew us in and inside it was casual, classic and they have a cool wood-burning oven that’s sure to keep your young ones interested. It was perfect patio weather and we know we don’t have too many of them left! Their bathroom is really spacious even without the changing table. They serve casual Italian fare and brunch until 3 pm on Sundays. 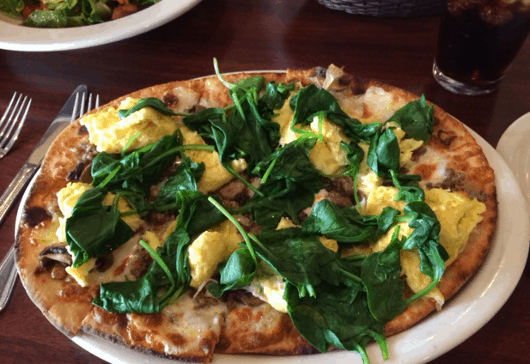 My husband ordered a breakfast pizza with eggs, sausage, spinach, mushroom and mozzarella. 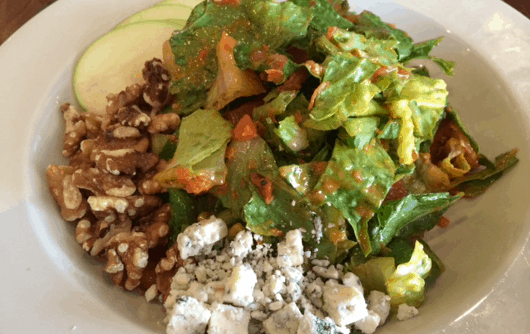 I chose their apple walnut salad with tomatoes and Gorgonzola. Service was quick, efficient and friendly. We enjoyed our lunch, it was delicious, fresh and perfectly seasoned. The crust of the pizza was thin, crunchy and excellent. Their menu looks great for dinner too and we will have to come back for their gelato! I really enjoyed Polovina and their friendly atmosphere and we are looking forward to go back with our son! My husband and I loved our quiet and lazy Sunday lunch. We even tried not to talk about him…too much!